‘Tis the season of goodwill, and… lots of party appetizers! 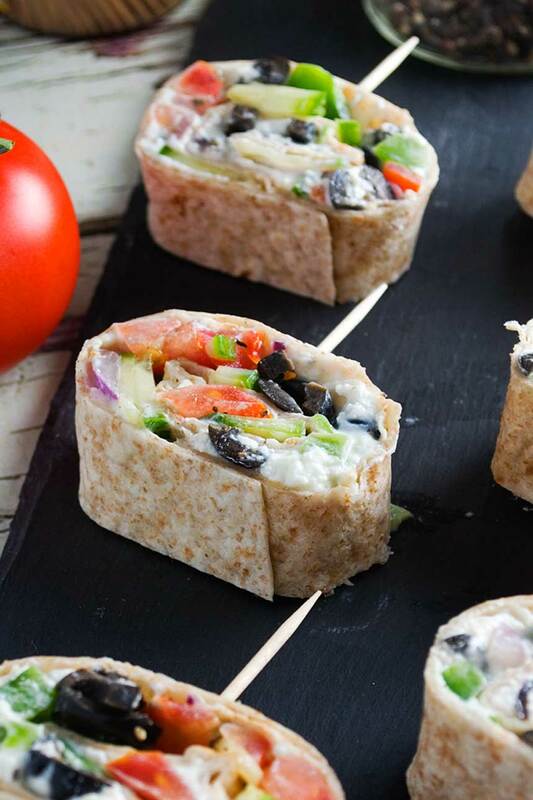 The party season is in full swing, and we all need plenty of simple party appetizer ideas. Specifically, simple appetizers that look like you’ve spent ages making them… but actually they’ve taken you 5 minutes. You know the sort. The sort where you don’t really even need a recipe. No cooking required! They’re really QUICK and EASY to make with just a few ingredients. Pretty fool proof, actually, as long as you don’t sprinkle over too much of the toppings (the voice of experience!). They’re perfect for taking along to others’ parties. Keep the rolled-up tortillas wrapped in plastic wrap until you arrive at your destination, then chop into pinwheels and serve! There are a million different variations on the theme. 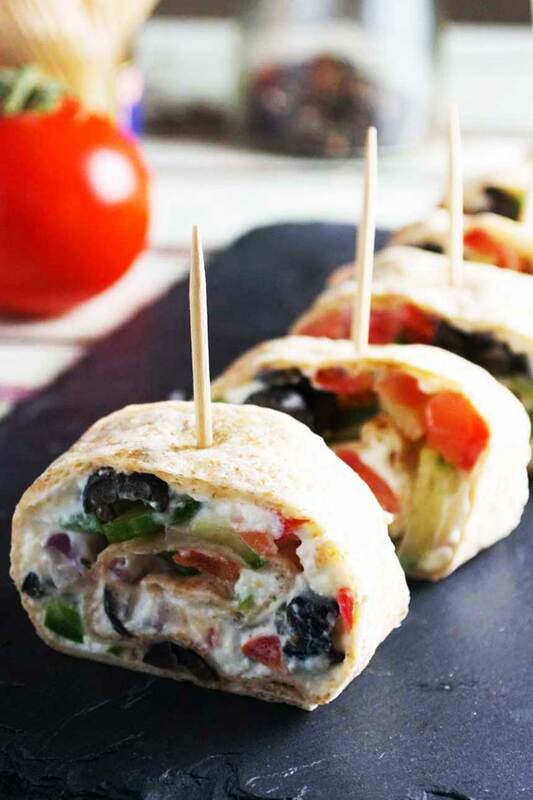 Don’t like the idea of Greek tortilla pinwheels? 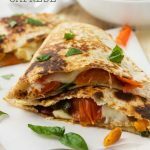 No problem, make them with pizza flavours, posh cream cheese and smoked salmon, or just plain ham and cheese. I’m sure you aren’t surprised that I’ve chosen to make Greek tortilla pinwheels. Deliciously fresh tomatoes, cucumber, olives and feta cheese just seemed to lend themselves perfectly to this idea. Many pinwheel recipe ideas I’d already seen around use cream cheese as a base spread for the tortillas. Which is what gave me the idea of mashing feta cheese with a bit of Greek yoghurt to make a spread with the same consistency of cream cheese. 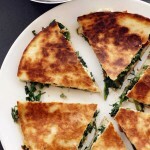 Greek quesadillas – another favourite easy Greek recipe stuffed with spinach and feta cheese! Click to check it out! I have to say it works perfectly. Just spread a layer of this feta-yoghurt spread all over your tortilla (leaving a small border around the edge), then scatter over small cubes of the other ingredients. Sprinkle over a bit of oregano and black pepper, and you’re ready to roll! It’s best to wrap your tortilla rolls in plastic wrap and refrigerate them for about half an hour to make them easier to chop. Then make sure you use a big sharp knife and you’ll have no problem cutting them into lovely rounds. I like to serve my pinwheels stood up on their sides, with a cocktail stick poked through the top to keep them together. But you can also just lay them flat on a plate. Arguably, you can see the insides of the pinwheels better this second way. As I’ve said, these are super easy to make, but I’ve still made you a little video to help you on your way. 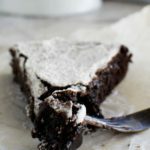 Let me know if you try these, or try adding other tasty fillings! An easy little party appetizer that takes hardly any effort to make but looks pretty cute! 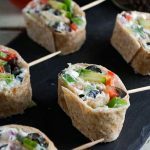 Just chop Greek salad bits, scatter them over a feta and yogurt spread on a tortilla, roll up the tortilla, and chop into rounds. Delicious! Have all your prepared ingredients ready. Lay out a tortilla on a board or other clean work surface, then spread with the feta cheese and yoghurt mixture. Leave a small border clear around the edge. Sprinkle the salad veggies evenly all over the cheese, then sprinkle over the oregano and pepper. Roll the tortilla up as tightly as you can, then wrap in plastic wrap. Pop into the refrigerator for about half an hour to firm up a bit. Unwrap the tortilla and chop into about 8 even rounds. To serve, lay out flat on a plate (or stand on their sides and poke through with a cocktail stick – your choice!). Also see ‘how to’ video above! You can prepare these ahead, then take them along to your party. Roll up, wrap in plastic wrap and take along to your party like this. Then slice when you get there. Just don't prepare TOO far in advance. These certainly don't keep very well until the next day. 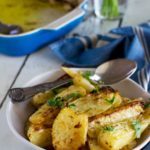 These are very easily adaptable according to what you've got in your fridge. 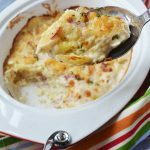 Spead with cream cheese instead of the feta and yogurt mixture, if you like, then add chopped sundried tomatoes, bits of parma ham, grated cheese, fresh herbs, or whatever you like! To be honest, the amounts stated in the recipe above are just a rough idea. Just use a small handful of everything and that will be about right. 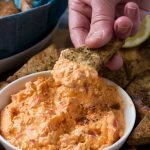 I love an easy appetizer and love ones with lots of flavor even more. These are such a great idea because you can make them in large batches. Lovely recipe and Happy New Year! YES, these are so easy to make in large batches. HAPPY NEW YEAR, Janette! Love these pinwheels, they will be perfect for NYE! And the flavors are amazing! 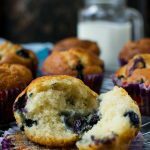 Pinned to try them! Happy New Year! Thanks Mira. HAPPY NEW YEAR! This is my kind of party fare, Helen! And I love how easy these are to make, but still look so pretty and I bet they taste absolutely delicious! Thanks Marissa, and … Happy new year!!! Um, YUM! These look awesome. 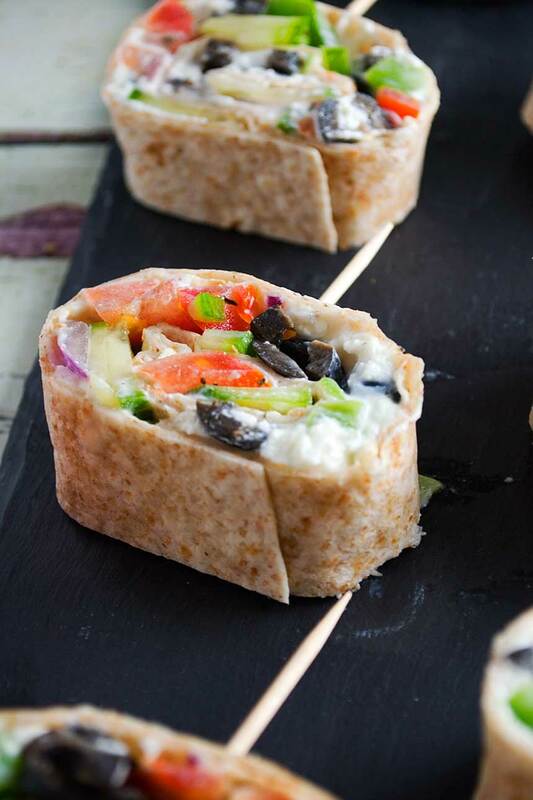 Perfect for a party, a quick lunch fix or even an afternoon snack! Hi Karly. Thanks so much for passing by. Hope you give the tortilla pinwheels a go some time! Belle année 2017 Helen! J’espère resté à tes côté encore cette année. 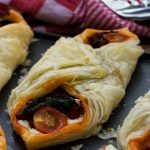 Continue à nous faire rêver avec tes délicieuses et gourmandes recettes comme celle ci!! Merci beaucoup, Eva… Bonne annee! I LOVE this! Pure genius! 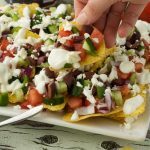 I’m a big fan of Greek cuisine – I could eat it every single day and be a very happy woman. And I’m loving the wrap idea! Wrap for lunch and cut into pinwheels for an awesome app! Thanks, Kathleen. I almost felt like this was too easy to post, but then I know it’s often ideas that people are looking for, rather than how-tos. 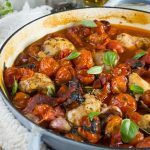 I love reading your blog!, I can’t wait to try this recipe, I sure hope that they will taste great. Where did you buy most of the ingredients? Can I use a plain tortilla? Hi Kate. 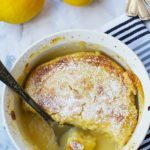 Thanks so much – I take that as a huge compliment that you enjoy reading the blog, and hope you do try this recipe soon. I just get the ingredients from my local supermarket, but it’s no big deal if you can’t find one or two of them. Just use what you can get and you’ll get similar results. And yes, of course you can use a plain tortilla. Any tortilla will work.